Today’s Final Jeopardy answer (in the category 19th Century Authors) and statistics for the Thursday, December 13, 2018 game between Mary Kate Moriarty, Faris Alikhan, and 1-day champion Elana Schor. 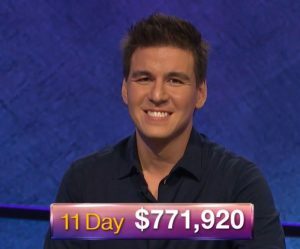 Today’s Final Jeopardy answer (in the category Sci-Fi TV) and statistics for the Wednesday, December 12, 2018 game between Elana Schor, Andy Greeley, and 1-day champion Nicole Cocklin. Today’s Final Jeopardy answer (in the category Bible Books) and statistics for the Tuesday, December 11, 2018 game between John Henning Schumann, Nicole Cocklin, and 1-day champion Francesco Caporusso. Today’s Final Jeopardy answer (in the category 2-Word World Capitals) and statistics for the Monday, December 10, 2018 game between Francesco Caporusso, Swetha Dravida, and 1-day champion Staci Huffman. Today’s Final Jeopardy answer (in the category Opera) and statistics for the Friday, December 7, 2018 game between Nick Wawrykow, Staci Huffman, and 4-day champion Dave Leffler.